Mexican Street Corn in a cup! We’ve got a plan to make this creamy, spicy addicitive dish in under 20 minutes using fresh corn and ingredients you probably have on hand. So just what is Mexican Corn in a cup? Is it really served freely in the streets of Mexico and how is this recipe different than the traditional version? Most importantly, is it really all that it’s made out to be? In the streets of Mexico, vendors sell elote (grilled or roasted Corn ON the Cob,) slathered with various combinations of butter, mayonnaise, cotija cheese, hot spices and lime or lemon juice. The husks are often pulled down so that there is a handle to grip the corn as you proceed to devour it. When offered OFF the cob it’s called esquistes. 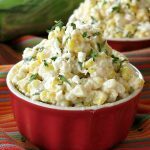 Meanwhile, until said vacation occurs, I created a totally accessible alternative…a dish that is easy to make and enjoyed without pulling out the grill, buying special cheeses or even making a mess..and is equally addictive. If you’re looking for an easy side dish for Tex Mex Tuesday or an easy recipe to wow a crowd…this recipe is for you! I’m not going to bash frozen corn or canned corn. I use it in recipes all the time. But, fresh corn definitely edges these options out when it is available. It has a sweet pop of flavor that can take a recipe over the top. 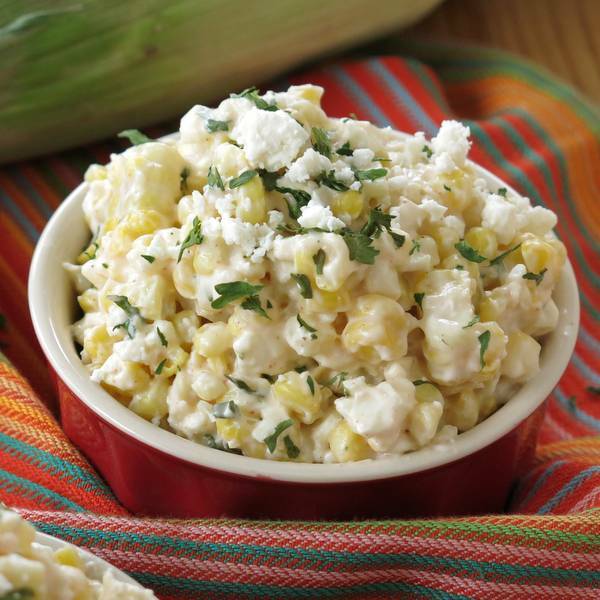 Since corn is the main ingredient in this recipe, it is definitely worth the effort. Good news! Follow these directions for microwaving corn on the cob in the husk. It literally takes 6 minutes for 4 cobs and almost all of the strands come off when you pull the husks off the cob. No fuss. No mess. Just sweet kernels of corn. Use a knife to cut the corn off the cob. Once you’ve had it, you’re going to want more. Trust me. Consider these tips when you come up with your game plan. Cojita cheese is traditionally used. But feta cheese is a very, very good alternative. The reduced fat version brings the calorie count down and I always have some on hand because I love it! 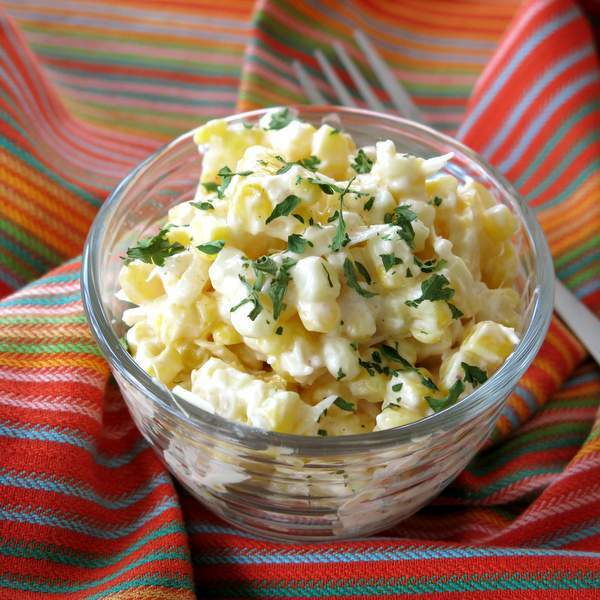 Check out these recipes with feta cheese if you’re a fan too. Sour cream is often used in this type of dish. Use non-fat Greek yogurt instead to up the protein and give it just a bit more zing. I’ve used light sour cream too. Both are very good! Top it off with chopped parsley or cilantro for an authentic presentation. Keep a big jar of dried chopped parsley on hand to up the presentation factor for any dish. Add as much or as little heat as you desire! I used a very conservative amount of cayenne pepper in the instructions. Enjoy this hot or cold. Hot is sooo good. If you serve it cold…you might just want to call it a salad. This brings me to yet another option for this delicious combination of ingredients. There is a time and place to put out a plate of chips and call this a dip! I added black beans and chopped tomatoes to the version below and presto chango…it’s a hearty party appetizer. Double up on the sauce if you go this route. 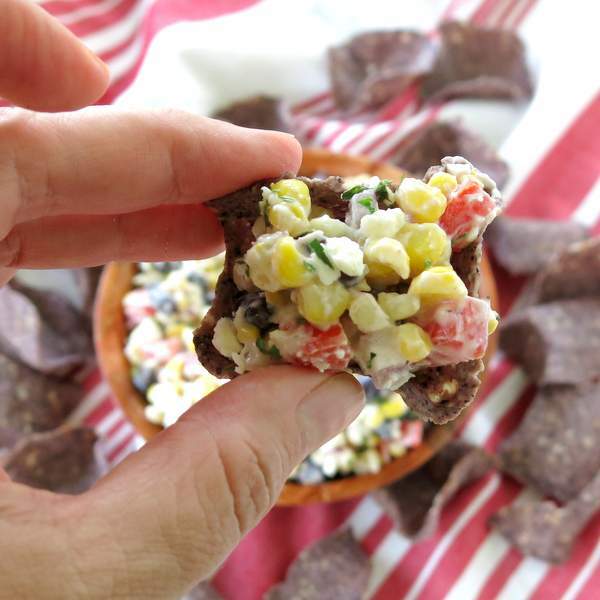 Head over to Mexican Street Corn Dip for the complete recipe. Any way you serve it, you are going to be very, very happy! If you make this recipe and share it on social media, remember to tag @DinnerMom and show us what you are cooking up! 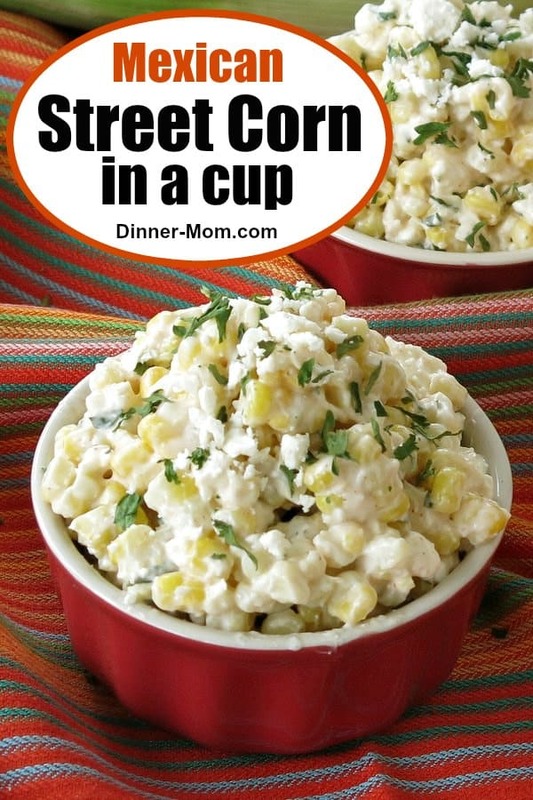 Follow this plan to make Mexican Street Corn in a Cup and you'll be enjoying this creamy, spicy addictive dish in under 20 minutes! Follow these directions to microwave corn on the cob. 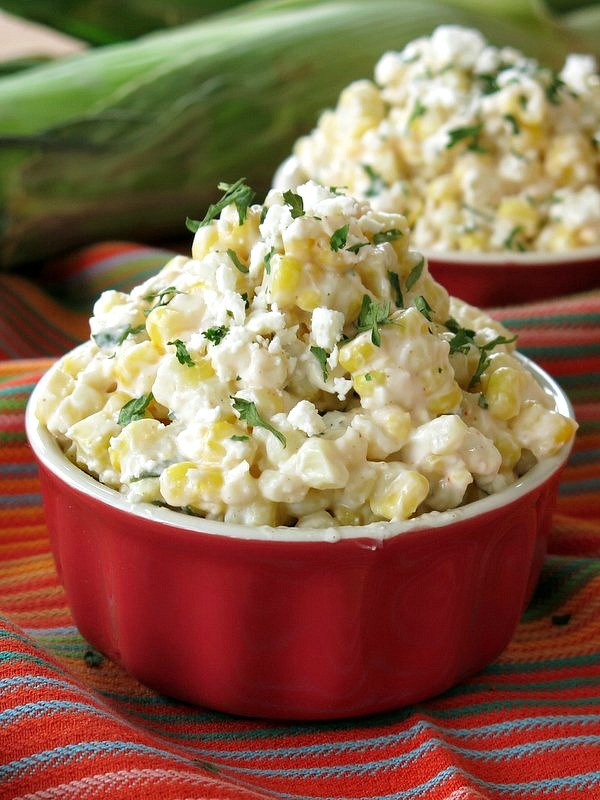 While the corn is cooking, combine mayonnaise, yogurt, lime juice, garlic and cayenne pepper in a serving dish. 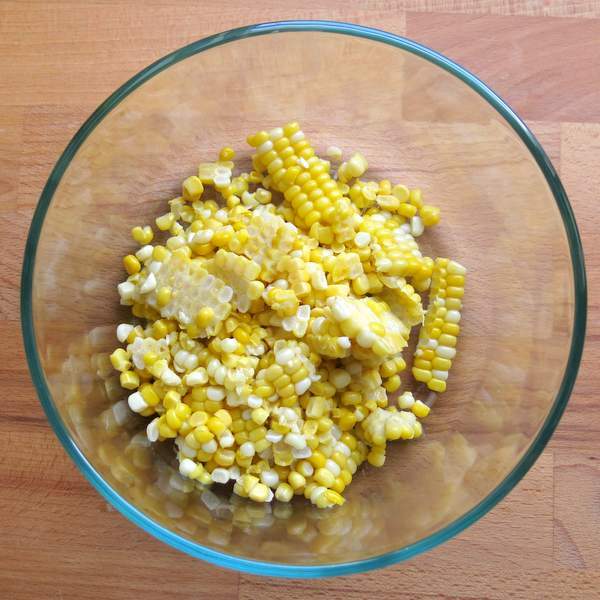 Cut corn from the cobs, add to serving dish and stir to combine. Sprinkle with garnish, if using, and enjoy! This corn in a cup looks so creamy and good!!! I love Mexican Street Corn. I bet this is out of this world! This is very good, even with frozen corn (defrosted first). Making this again for a party. How far in advance can it be made? 2 days!! But make sure corn is TOTALLY DEFROSTED before mixing all ingredients!! Keep sealed and covered in fridge….yum!